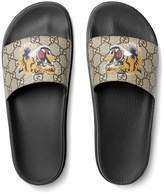 A slide sandal in GG Supreme canvas with printed tiger, a symbol that has quickly become one of Gucci's signature details. Beige/ebony GG Supreme canvas with tiger print, a material with low environmental impact. Rubber sole. Moulded rubber footbed. Made in Italy.